On November 8, 1793, The Louvre Museum in Paris, opened to the public for the first time. If you are ever in Paris, don’t miss it! And if you are not planning a trip to France in the near future, stop by The Louvre’s website. I could spend spent hours on their website. So much beauty in one place. If you have any interest in the history of Paris or France, or in architecture, be sure to click on the “History of the Louvre” tab. It was originally built as a moated fortress by King Philippe Auguste in 1190. Yes, 1190. Over 800 years ago. That’s incredible! C’est incroyable! If you click on the tab, “Learning About Art” and you can get a closer look at several well-known sculptures and paintings, including The Mona Lisa. “These interactive multimedia modules allow you to see the details of an artwork through a magnifying glass, while commentaries and animations give you its historical and artistic background.” Even in photographs, the artwork is breathtaking. Which leads me to the reason for this post. My daughter left artwork on her breakfast plate this morning. She recently began boycotting toast crust because someone (MacGyver) told her that eating the bread crust would make her hair curl. He failed to take into consideration that she might not want curly hair. I saw this and thought, “A picture is worth a thousand words.” Un dessin vaut mieux qu’un long discours. My daughter left a love note for me with her toast crust. How sweet! 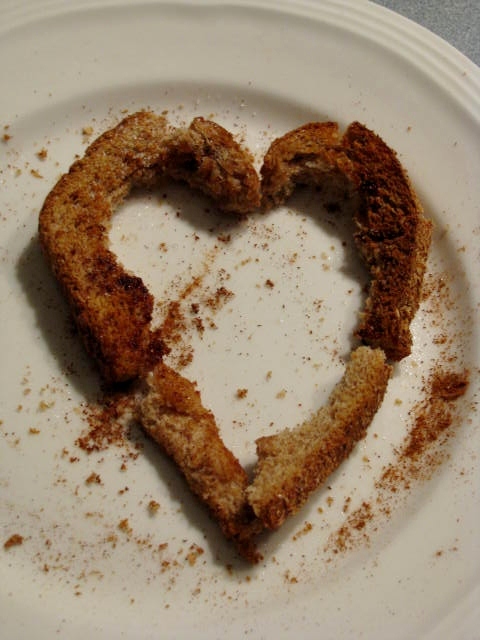 When she came home from school, I thanked her for the crust heart (or heart crust, or crusty heart). I told her how much I appreciated her little love note. She rolled her eyes and said, “A heart was the only shape I could make with the crusts. I do love you, but I just did that because I wanted to see whether or not you would notice that I had left you a shape on my plate.” I will hold on to my original belief that she left me a heart because she loves me! Go find some art and beauty in your day! I love it, she is so sweet! there is NO WAY i could ever imagine YOUR lovely daughter rolling her eyes at you…..